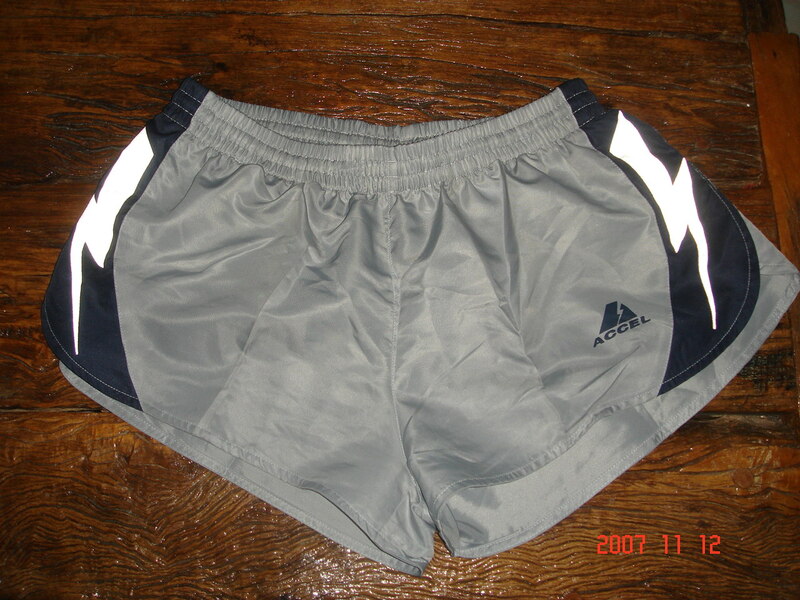 I bought these Accel Running Shorts at SM City Iloilo for a discount price of Two Hundred Pesos ( P 200.00) each. 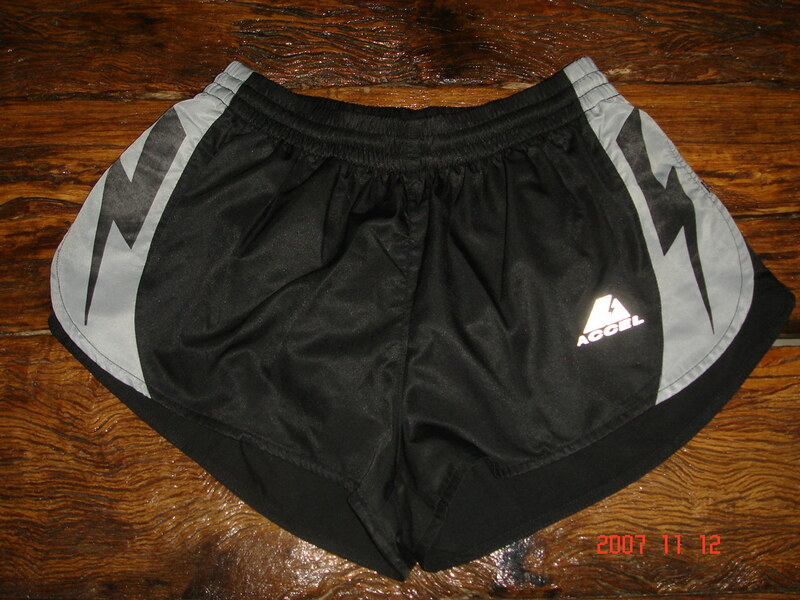 I used the black one during the 5th Animo 10K Run last Sunday while the gray one is used during my practice runs in Jamindan. They are comfortable and light and I enjoy wearing them. I had my “tempo run” at the Oval Track in Laoag City at 5:10 PM of 29 November 2007. I wanted to see how far my body could go and how I feel running at race pace, assuming that I am in a 10K race. After stretching and a little warm-up/jog, I started my 25-lap run around the oval track in Laoag City. My average pace per lap was 2:08.5 minutes in the first 14 laps and I was able to make my pace faster on the remaining laps with an average pace of 2:05 minutes per lap. I was able to finish 25 laps at 53:20 mins. My average pace was 5:20 minutes per kilometer/8:35 minutes per mile. My average pace per lap was 2:07 minutes. I did not feel any pains and tiredness after the run. I am slowly improving my pace and eventually my PR best time for the 10K as a part of my preparation for the 2008 Pasig River Heritage Marathon. I think I will have to validate this on Sunday during my participation to the Executive 10K Road Run. Improving and focusing more on my running form, footstrike, breathing rhythm and strengthening my leg muscles have positively contributed for my progressive improvement on my marathon training. 1. If there is swelling, injury can be minimized by keeping the swelling down. This is done with R-I-C-E (Rest, Ice, Compression, Elevation). These are immediately applied after the injury occurs and continuously done for a day or two. After 48 hours, you should start promoting blood circulation by applying heat, massage, gentle exercises, and even ultrasound procedures done by Physical Therapists. 2. Apply ice (using ice bag) to the injured knee right after running/after stretching for ten (10) minutes. 3. Check training paths/routes for banked surfaces and try to run through them. 4. Try available or commercial arch supports. My running shoes are one size bigger because I try to insert arch support/s for more cushioning and comfort to my feet. 5. Strengthen your quadricep muscles through gym workouts. Use the Leg Extension Machine, Leg Press Machine, Elliptical Machine, and Stationary Bike. Start with the lighter weights or lighter resistance. For the stationary bike, you should balance your “cycle resistance” vs. “your cycling RPM”. You should be able to reach up to 60-65 rpm and progress slowly. 6. Experiment and try this. Try pointing your toes slightly inward while running/jogging slowly. 7. Improve flexibility of your calf muscles and hamstring muscles. 8. Got milk? Drink your “warm” milk (non-fat) before bedtime & during breakfast. 9. “Shuffle”, don’t sprint or use ball-heel footstrike. Just “glide” your feet off the ground and slightly bend your knee when striking the ground. Use the “heel-ball” footstrike when “shuffling” to cushion the impact to your knees. 11. Try “jogging” in the swimming pool. 12. Have your regular body massage. 13. Sleep at least eight (8) hours every night. Don’t forget to take your mineral & vitamin tablets. If possible, you should make the habit to elevate your knees (with pillows) while sleeping. 14. Pray & Think positively. Stay Healthy and Good Luck!!! I just got the news that my “Marathon Kids” (son & daughter) will be running the 2nd City of Angels Half-Marathon in Los Angeles on the 2nd of December 2007, this Sunday. It will be the first run for my son and the second time for my daughter. My wife told me that my son, John, had been running regularly and trying to prepare for this race while he is busy with his studies in the College of Law. My wife is not sure whether our daughter is well-prepared and diligently trained for this race event. I hope she was regularly joining her running sessions with her club without the knowledge of her Mom. I wish them both “Good Luck and More Power”. My daughter had a sad experience with the organizers of this race last year. The organizers lost her designated race number! Her race number was stolen by another runner. In the US, race packets to registered runners are available for pick-up in one of the Hotels in Downtown Los Angeles, a day before the scheduled race. On this particular race, my daughter and I went to LA Hilton Hotel in Downtown in the morning of Saturday (o3 Dec 2006) to get our respective racing packets. To our surprise, her race number had been taken by another runner! Her designated race number was #2888 and it was stolen! This is not supposed to happen as other race organizers in LA (LA Marathon) would look first with the identification card (Driver’s License or California ID Card) of each runner before giving his/her race packet. I had a suspicion that the guy who got her race number was a Chinese! My daughter was given another race number and runner’s chip on the day we tried to pick-up her race packet. We later found out from the results of the race that an unknown male runner used my daughter’s race number and started and finished way behind us. He finished the race in 2 hrs 33 minutes & 03 seconds with split time at 10K in 1 hr 06 minutes & 14 seconds. He had 10:40 minutes pace in the 10K and 11:41 minutes pace for the half-marathon. The guy did not register for the race but just simply run the race using my daughter’s original designated race number. In the US, registration in road races are done “On Line” or through a designated Website in the Internet. Late registrations are done a day before the race on the designated place where race packets are being personally & individually picked-up by registered runners. Each race packet has inside in it the following—runner’s race number, complimentary T-shirt or Finisher’s T-shirt or singlet, runner’s chip, route map, instructions of parking areas or drop-off point where runners are being picked-up by bus and transported to the starting line/area, and other complimentary products of sponsors. Strictly, there are no late registrations on the day of the race! How I wish this kind of procedure in the US shall be applied here in the Philippines. 1. Consult your doctor or family physician and get advise from him/her if your body could sustain stressful training for a marathon race. 2. Maintain a Training Journal/Training Log or a Running Diary with the following data: Date & Time of Run; Duration/Time of Run; Distance of Run (Miles/Kms); Weather; Place of Run; Brief Description of Run (LSD, Speed Runs, “Fartlek” Runs, Fast Continuous Runs @ Race Pace, Tempo Runs, Hill/Trail Workouts or Altitude Training); Blood Pressure & Pulse Rate before your run; and overall feeling before, during and after the run. 3. Progressively increase your weekly mileage but not more than 20% of your previous week’s mileage. Don’t forget to “listen to your body”. Do not overtrain/overstrain your body. 4. Use your training shoes on D-Day of the Marathon Race. Do not use your brand new running shoes on race day. Do not use also racing flat running shoes. 5. Do your stretching exercises before and after your running workouts. 6. Always set aside one or two days per week as your rest day. If injured, take more days to rest. Two weeks is the least you can rest due to injury and be able to catch up and adjust with your marathon training. However, if you miss one month of your running workout, it would be best to scrap your plan to run your first marathon race. 7. Maintain your body hydrated during long runs. Use any available “water/hydration” belt or pack in the sports stores like “Camelbak, Nathan, Access or Nike” for your long run practices only. I take a sip of water from my bottle jug every 3-4 kilometers. 8. Don’t miss your long runs during the week. Try to run at least 3 hours or 35 kilometers in one of your long runs at least 5-6 weeks before the Marathon. 9. Eat moderately and properly. Take a lot of carbohydrates and protein foods. Try to drink not more than three bottles of beer after long runs and speed runs. Take also multi-minerals & vitamins everyday. I take Centrum, Vit C & E, Calcium, & Glucousamine (for my joints/knees) tablets everyday. I also drink Protein Whey after my Gym Workouts. 10. Don’t be afraid or ashame to walk during your long runs. Take a sip of water from your water jug while walking. Take at least one or two minutes of walking and get the feeling of starting to run again. 11. Join road races as part of your marathon training. Select at least one road race every month, 3-4 months before the marathon. Join 10K up to Half-Marathon (21K) races to evaluate your training program. This will also train you to be confident and remove the feeling of nervousness in joining road races. 12. Sleep more hours during nighttime as you increase your mileage. As an average, sleep at least eight (8) hours every night. Take a warm shower before bedtime. 13. Get a decent body massage at least once a week. 14. It is advisable to have your running workout once a day. Preferably, in the morning as most of the road races are conducted early in the morning. 15. Reward yourself every time you reach your training goal every week/month or every road race you join before the marathon. 17. Read and browse back issues of Runners World Magazine or previous posts of my blogsite to maintain positive feeling on your running program. 18. Think positively. Position your running shoes & running attire in a distinct place in your bedroom where you can see them once you wake up from your bed in the morning. 19. Remember that your primary goal in running the marathon is to finish the race without any injury. You have time to analyze and evaluate yourself on your strengths and weaknesses during your recovery period/after the race. You can make adjustments with your training program if you want to improve your PR best time in your next marathon race and always remember that there are more marathon races in the future. Hereunder are the results of the 42K National Finals of the 31st National Milo Marathon held in Manila, Philippines on 18 November 2007. The results were taken from “RACE–Race Results Specialists”. 26 Nov 2007 (Monday)—Long Run with Slight Tempo Runs at Libingan ng mga Bayani; “Heritage” Mile; Lawton Avenue; & at The Fort. Duration of Run: 2 hrs 35 mins 18 secs. Estimated Distance: 23-24 Kms/15 miles. 27 Nov 2007 (Tuesday)—Rest/No Runs; 30-minute “aerobics & taebo” workout @ Home (Music by Barry White, Bob Marley, James Last & Foo Foo Fighters); 5 sets X 20 reps Push-Ups; 5 sets X 25 reps Bend-Knee Sit-Ups & 2 sets X 50 reps Knee Bends. 28 Nov 2007 (Wednesday)—Speed Play/”Fartlek” Runs at the Libingan ng mga Bayani; Time of Run: 8:30-9:50 AM; 6 reps X 800 meters @ 4:00-4:10 minutes, jog 4:00 minutes as recovery run in between reps; 2 reps X “Heritage Mile” @ 8:00 minutes; Duration of Run: 1 hour & 20 minutes; Distance of Run: 13 kilometers/8.125 miles. 29 Nov 2007 (Thursday)—Tempo Run at the Laoag City Oval Track at 5:10 PM; Duration of Run: 25 laps at 53:20 minutes; Average Pace per Lap: 2:05-2:08 minutes; Average Pace: 5:20 minutes per kilometer/8:35 minutes per mile. Total Distance: 6.2 miles/10 Kilometers. 30 Nov 2007 (Friday)—Short Slow Run on the Roads of Barangay Dibua from 4:10PM-5:00PM; Pace of Run: 6:20-6:30 minutes per kilometer/10:20-10:30 minutes per mile; Total Distance: 7 kilometers/4.375 miles. 01 Dec 2007 (Saturday)—Rest, Massage, Watch the Movie “The Kingdom”, and Sleep Early.